I finally got around to installing a extra permanent front sprinkler yesterday, and I replaced the old existing one as well which was leaking underground with bad connections and had a leaky rusted out thread where the sprinkler screws on as well. Uploaded by Daniel on 2019-02-28. Great work @Prawns. It's been a very hot summer for so many of us. I'm sure many community members will be inspired by your work and keen to see the difference next year. Yeah it was a really hot summer here as well, Hopefully we get some decent rain soon as some people with shallow water bores around here have actually run dry! Many thanks for joining in the discussion and making your first post @MrDruitt. I'm sure @Prawns appreciates the feedback. Let me also extend a very warm welcome to the community. We're pleased you could join us and encourage you to share your own projects with the community. Feel free to post whenever you have something to share or need a hand. And please let me know if you ever need help getting the most from the site or have any feedback about how we can improve Workshop for you. 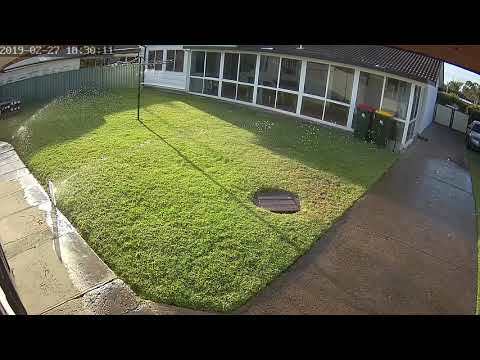 Ive actually got plans to install popup sprinklers in the backyard in the future - so I definatly appreciate the recommendation of the K Rain K2 I was going to install them out front as well but Ive never used them before so shied away a bit incase the odd car driving over them might be a issue. what seeds did you go with and when is best time to seed? Thanks for joining in the discussion @RaceQuest. I'm sure @Prawns and many other Workshop members will be happy to help with your lawn. Where are you based and what's the condition of your lawn currently? Feel free to post anytime you need a hand with a project around the house or garden or have something to share. We look forward to reading about all your projects and plans. Great effort to see you putting some Sprinklers in. Sure your lawn will benefit. I used to work in the Sprinkler business and if you are looking to upgrade any time soon I would suggest getting some design help from an expert. They would probably reccomend that you put sprinklers in the corners of the block and having them set at 1/4 circle. You'll get a better watering pattern and it will be more efficient - won't be wetting the paths and driveway. Also gear driven pop-ups will be more efficient than impact driven sprinklers on risers and they won't get in the way of your mowing. There are other brands though such as Toro or Rainbird. Good luck with it and sure your lawn will be better soon with the extra water. Message me if you want to know more.